Aristolochia fimbriata is an excellent hanging basket plant. Its prostrate habit and small stem, usually up to 18 inches long, make it more suitable than other Aristolochia for basket culture. It is native to Argentina, Paraguay and Southern Brazil. Blooming Time: Flowers are solitary and are formed under the leaves. It blooms throughout the summer. Culture: Aristolochia fimbriata like to grow in a light and airy place, but not in direct sunlight. Keep summer temperatures from 68-78 degrees and winter temperatures above 50 degrees. Water regularly during the growth period, once or twice a week. Water no more than once a week during winter. Fertilize with a balanced fertilizer every third watering throughout the growing season. It grows best in rich, well-drained soil. Young plants need to be repotted every other year, older plants every 3-5 years. Cut back in fall after blooming. 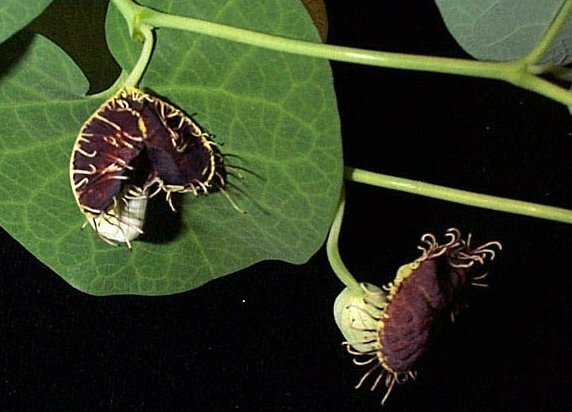 Propagation: Aristolochia fimbriata is best propagated by cuttings, but it can be grown from seeds. Take cuttings in the fall when flowering is nearly completed. Softwood cuttings should be 4 to 5 inches long. Treat with rooting hormones and place them in a fast draining propagating mix. Put them in a warm place, preferably with bottom heat. Softwood cuttings must be kept moist. Start seeds by soaking in water for 48 hours and surface sow them. Seeds need light to germinate. Aristolochia fimbriata was featured as Plant of the Week April 28-May 4, 2000.